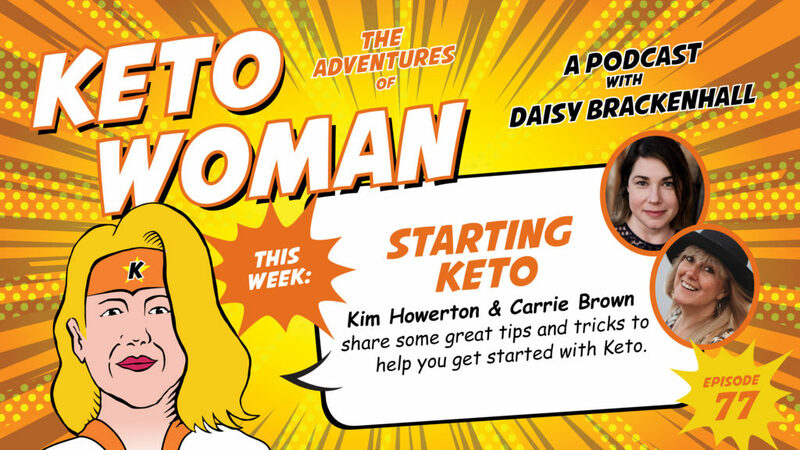 Welcome Kim and Carrie to the Keto woman podcast. How are you doing today? It’s nice to be back together again even though it is only remotely. It is, but you know what, Denver will keep me going for a few months. We had a fantastic time in Denver, the three of us all hanging out and being ridiculous and eating great Keto food and just, you know, chewing the cud and catching up and it was awesome. And that’s going to keep me going for a little while longer at least. I think you two are going to be getting together a bit sooner, aren’t you? Are you both going to Salt Lake? Yeah, we’ll be in Utah. We are off to Low Carb Utah at the end of April. So we will uh, we’ll drink a toast to you. Daisy. Thank you. With the wonderful Keto Chow people – I’m very jealous. I’m sure it’s going to be good; it’s a great looking lineup. So I thought it would be really nice to have a go-to Beginners Episode that we can send anyone to who just wants to know all the basics of how to start Keto. But before we do that, perhaps you could just tell us a bit about yourselves in case people don’t know who you are. Kim? Okay. Hi, I’m Kim Howerton and I am a Keto coach. I teach people the where’s, why’s and how’s of Keto. I also love food, so I do recipes and cookbooks. But my primary kind of mission in the world is bringing some ease and comfort and joy into people’s lives by making Keto less complicated because I myself can overcomplicate everything. And so I know that instinct and I want to help other people not indulge that instinct too much. I am Carrie Brown and I am first and foremost a recipe developer, which means that I publish recipes for free on my blog. And then I also create cookbooks to serve the Keto and Low-Carb community. The other thing that I have a passion about, apart from showing people that Keto can be more delicious than any food they’ve ever eaten before, is how incredibly powerful Keto can be for helping people with mental health issues. I myself spent most of my life struggling with bipolar two disorder, but I have completely eradicated all my symptoms and the need for any pharmaceutical medications through use of a Keto diet and a few supplements. So those are the two things that I’m passionate about and that’s what I do to help people on their Keto journeys. And of course your, well you have a few podcasts on the go, but you’re a regular Dude. Yes, I am cohost on the 2 Keto Dudes podcast, which is a weekly podcast that I do with the wonderful Carl Franklin who has healed his type 2 diabetes following a ketogenic diet. I also podcast every month, the first Monday in the month with Aarn Farmer from the My Sugar Free Journey podcast. And in that one we focus on all the cooking things. So that’s a podcast where if you want to know what the best thickener is, or the best Keto sweetener or how to do cooking things, that’s the podcast for you. And she is a featured player on the upcoming podcast that I’m producing, which is called Keto Life Support. And I’m very excited about that because that too is going to be a lot about food and Kim and I love, love, love our food. We do. The first episode we recorded was kind of a hoot because I don’t know that there are two people in the world that have spent an hour happier to discuss a spice. So yeah. …the simplest. Yours was cardamom, but mine was the simple amazingness of onion salt. Interesting. Interesting choice. So while you’ve mentioned that, just tell us a little bit more, give us a bit more of a tease about the new podcast. So the new podcast is actually, um, my idea behind it was that I just find so many people out there in the world don’t have as much support as they want when they start Keto. So maybe their spouse isn’t into it, maybe their kids aren’t into it. Maybe everyone thinks they’re weird and their doctor told them they’re going to get lupus. You know, there’s kind of a pretty negative world sometimes and not all of us have enough soft places to go. And so the idea behind the podcast was – if you need some Keto besties, I have some to lend you. There’s going to be me, Carrie, who you’ve met today. Um, there’s going to be a little-known man named Ken Berry. Who’s that? No, I’ve never heard of him! You’ve never heard of him right? Yeah. Um, and Neisha Salas Berry, who is awesome as well. And so the four of us kind of are rotating through talking about, you know, medical thoughts, uh, food thoughts, lifestyle thoughts, how do we do this, how do we support? And then there’s also going to be a community right alongside it, a Facebook community so that, um, you get as much support as you need on your journey and you feel you’re just so you’re not alone. You’re not alone here. That sounds fantastic. I’m wondering maybe if we should give a little bit of a tease, Carrie. Release the tease? Well why not? Why not? We haven’t completely decided on the name yet, so we, we won’t drop that yet, but we’re going to start a podcast too aren’t we? I’m shocked! What’s happening? I usually know everything. Yeah, somehow… How did we manage to spend all that time together in Denver and it never came up in conversation. Because we thought we were dying of the plague. You two were very poorly. I feel very, very fortunate that I managed to escape the plague. I don’t know. We caught it. We were out. I’d like to offer a suggestion as to why we kind of didn’t talk to Kim or most other people we know about it because it’s not really going to be Keto heavy. What you mean you have other interests? That’s nuts! What’s wrong with you? We started talking a while back. I think I was, and I was trying to remember last night who suggested it first. I think I might have originally thrown the idea of doing another sort of food podcasty type thing. I think, as I recall, it came out of some person on YouTube that was criticizing a Keto Woman podcast that we did and we dared to talk about something other than Keto. Yeah, that’s certainly where it developed. This person kind of got upset and we like, well we, we do have other like brainwaves, we have other thoughts that involve things other than Keto and, and we actually have a lot to say about life and the universe and everything and, and… but apparently we can’t talk about it on the Keto Woman podcast. But a lot of other people were very interested in what we had to say. So I think that’s where the idea came from that then like let’s just do a separate one about all the other things we have to say and just make it completely separate from all the Keto things we do. Yes, exactly. So it’s separate but linked. So our thoughts were to do a much shorter form podcast but talking about, potentially the ideas we’re throwing around are, putting out two a week – one which is talking about a motivational or inspirational quote that we’ve come across that we really like and the other one was that sort of slightly old fashioned Agony Aunt type thing where somebody has an issue and I’m sure we all see it all the time in our Facebook groups when someone says, “Oh this happened and I don’t really know what to do about it.” So we’re hoping that people will send us those in and we can offer our suggestions. …we haven’t fully decided. A cuppa even. You do speak Brit, you’ve told me that before cause you used to have British nannies. Is that right? I did. I know what a boot is and a bonnet and things like that! We have all these different words. Some of them are funny. Some of them can get you into really deep water. Yes, especially when you’re angry and drunk or something. I can’t remember which one I used the other day and Carrie wrote underneath for translation for Carl what it meant in American. It means very different than, I can’t remember what it was, but had a very different meaning. Okay. So let’s get on to the topic for today. We could do this for like three or four hours. So we might need to get onto the topic. Thank you very much to the KKBs for giving me a list of suggestions to structure this podcast around. I thought it would be nice just to sort of flesh out, I suppose a series of tips, top tips of what to do, how to get started, what to avoid, what to do, what not to do, all the rest of it. So I guess I will just kick off and we’ll go from there. The first one is about measurements and journaling. I always add journaling because I think it’s important. So it’s about the measurements that it’s really useful to take before you start and then all about what might be useful to measure and journal as you go along. I think this kind of grows out of the number one thing when you talk to somebody who’s really gone into the deep end of Keto and you’ll say, “You know, what do you wish that you’d done before you started?” And they are all like, “Get your baseline numbers”, ” Take before pictures”, “Measure things”. Um, even get, you know, like a full blood panel – if not before your journey, like as soon as you can – because it’s really super interesting later on in your journey to have something to compare to. That being said, if that’s out of people’s budget or you know, lifestyle, you know, a simple picture in a mirror in clothes that show your body the way it is. Um, this will be the opposite of the way many of us like to take photos, which would be in clothes that make it look better than it looks. Exactly. It’s not for public consumption. You’re not showing it to anybody. Absolutely. And to get some measurements – all you need is a tape measure – is really helpful for sort of a starting place to have those things for posterity. In terms of other types of tracking, are you asking about like journaling your food and things like that? Well. So for example, I think yes, when, when you’re starting, and that’s exactly me when you said that – I did take beginning measurements. What I didn’t do so much was set like a monthly date or something to do those. And I wish I had, when I see people like Siobhan Huggins, for example, has a wonderful collage of, I think it’s probably just her face, but she sort of took the same picture every month and it’s so good to see that. And I wish I’d done that. But yeah, I think taking your basic weight, measurements, photographs and doing that, say once a month. But the other things that I think are useful to journal about: what’s your sleep like? what’s your mood like? your stress? what exercise do you feel able to do? And then you see, you start pulling out the non scale victories as you go, which are really important and more important than weight, which is what people often focus too much on. So I think conceptually you’re talking about kind of two separate concepts. One of them is keeping track of metrics, right? So, I’m going to have a set schedule that I’m going to track my photos, my weight, my measurements, and on this date, every month I do this. It’s my routine. And with that I can use it to motivate me or to see what’s happening when, because often we only pay attention to one metric. We pay attention to what the scale says. But we didn’t notice that we are down three pants sizes. We only cared that the weight didn’t move, you know, the scale numbered and it moves. So I think having multiple measures to track and not doing it too often, you know, once a month is plenty I think is very important. And then there’s a second concept, which is the day to day. So, there are different approaches and I think Carrie and I have very different approaches on this specific topic, but what do you track? What data do you want? Are you a person that needs data? Is a question. So what that would look like is keeping track every day of what are you eating? Maybe potentially using some type of an app to track what we call macros. Keeping track of your exercise, keeping track of how you feel, the less technical aspects, right? The emotion, the mood. I’m cranky today, I’m tired today. So like tracking sort of your experience on a day to day basis is sort of a secondary part and for me that was really essential because I kind of look at my Keto journey as a bit of an experiment, right? We’re our own experiment and when I have data I can use that to reflect how my experiment is going and I can see the effects right from that first category, what are the effects? Oh look this month I gained weight or I lost weight or my right bicep grew, like what’s going on? And then I can compare that to the day to day tracking and see did something change or is something different. Maybe there’s something I need to evaluate here. Exactly it’s the only way really you’re going to spot patterns because you forget so quickly and the only way you can really spot is, oh hold on. I remember feeling a bit like I feel today, which is rubbish, two weeks ago. What happened? And if you can actually go back in your diary and look at that and, oh this happened on that day and this day so maybe x, y or z is a potential problem that I need to consider going forward. Right. But I think Carrie has a different perspective, which I think is important for people to know about. And I think the main reason that the way we track or don’t track and the things we do, Kim, is so very different is that I came to Keto for very different reasons. So I did not come to Keto for weight loss. I’ve always kind of just magically hovered around the ideal weight for my height. So weight loss has never really been a thing for me. I came to Keto specifically for mental health and, in my case, that was Bipolar 2 disorder. And so, for me, a lot of the things that Kim mentioned is not, I’m not gonna weigh myself, I’m not going to measure myself cause those are not metrics that I’m interested in changing. But what I do wish I’d done a better job of. So whatever your reasons for doing Keto, one thing I would encourage you to make note of, and actually write it down somewhere is your non scale victories or, if you’re doing it for weight loss, your scale victories. Because people ask me now we know what changes have you seen on Keto? And I’m like, they become normal. So no skin tags, right? I no longer have any skin tags, but I actually have to remember that. It would be super cool now to just have this laundry list of all the things that I no longer have to deal with. And I didn’t do that. And I wish I had. And I think that would have helped me as I’d have gone along to, you know, we all get those days where it’s just like, oh why am I doing this? I’m, you know, and so to be able to get out a written list and go, oh, that’s why, because I’d forgotten that I used to have skin tags because our brains are very forgetful, so, oh yeah, I forgot that I no longer have psoriasis. I forgot that I no longer have skin tags. I forgot that I no longer need to use deodorant because I have no body odor. Because those things just become a normal part of life when you’re on Keto. And so it’s easy to forget that they were irritations that you had to deal with. So I do wish I had done a better job of keeping a record of that as I went and I think that would have helped me in those times where we all, you know, struggle. Just being able to pull that list out and go, oh yeah, that’s why I’m doing this would have been super helpful. It’s really true that you forget the excitement, isn’t it? See, I only have to see someone post a picture of their belt done up on an airplane and to go back and experience what that felt like. I was really naughty actually, and I never asked for a belt extender. I just always used to hide the fact that I couldn’t do it up with it draped cardigan or something over the top of it. So I never went through that. But when somebody is super, super excited and posts a picture of said belt done up, I remember that feeling and you’re right, we should have some kind of reminder that we can really remember the excitement for those things. And those are the things I think that make more difference than losing a certain amount of weight. And at the start, so for the first three months, I did pee on sticks and I did track how dark purple my pee sticks were every day. My peetones. But again that was not something you really need to do if you’re doing Keto for weight loss. For someone who was having a mental health issue, keeping ketones super high can be super important. So I was just doing that just to make sure that when I got started that the things I was eating were translating into producing large amounts of ketones, which was the goal for us because we were trying to heal my brain. And I did that for three months and then I got confident with what it takes to keep me at a certain level of ketones and then I stopped. The other thing that I find incredibly useful is my Oura ring. So I do have an Oura ring but you can use other things to track sleep. I find tracking my sleep and my activity is incredibly useful. So that is something I track, although I don’t track a lot of the other things that Keto people do. Assuming we are going to do some tracking. We mentioned Siobhan earlier, so I think in her honor we will just list a few things that would be a good idea if you’re going to get that baseline blood testing lab work done. And I do think, if you have any kind of sneaking suspicion that you have issues with any of your health markers in that way, it’s so useful to do. Obviously I appreciate that, you know, it might be a budget issue but if you can at all, it’s very useful isn’t it, to just have that baseline panel? So what things should we test? What’s the bare minimum that’s going to be really useful to have to start with that we can compare say a year later or something? I think if we’re looking at metabolic markers, there are a couple that are super important. The first would be, and these are ones that aren’t, so there are ones that your doctor will probably like smile and nod about testing, like a CBC (a complete blood panel), you know, that’s a good idea to get. If you have any thyroid issues, you’ll also want to get a complete thyroid panel. Now most doctors, or if you suspect I should say you might not know you have a thyroid issue, but it’s possible. If you have any of the kind of fatigue, brain fog, unexplained weight issues, I would suggest getting a complete thyroid panel. And so often doctors will only test one thyroid test – the TSH, but there are I think seven. And if you go to stopthethyroidmadness.com (it’s a website) they list all seven of the tests. Yeah, and it’s brilliant. That’s what I did. I was diagnosed with underactive thyroid. I had that diagnosis for 20 years before I investigated and it was that website and that’s when I got my free T3 in particular tested but other things as well and changed my treatment from that point. Yeah, absolutely. There’s, you know, there’s thyroid is many hormones and well, I mean it’s a thyroid hormone, but it’s many interactions within that system. You know, T4 has to convert to T3. If it doesn’t convert you have this problem. Your TSH could be normal, it could be low, it could be high but, unless you’re looking at the full panel, sometimes you’re going to miss things. In conjunction with symptoms. That’s the other thing. It’s one of those slightly tricky ones isn’t it, that you can’t diagnose simply by the numbers? Any good doctor will use the symptoms as well. Right? We are sadly, or maybe not sadly, but we are not like data input/output machines, we’re complex systems, which means that, you know, maybe if this one hormone is a little bit low, but this other one over here is a little bit high and they’re compensating… you know, so it’s not really clear cut and nothing can be looked at in a vacuum. But I would say your complete blood panel, your full thyroid panel, you definitely want to get your A1c. Now some doctors will just test your glucose, your fasting glucose. However, a lot of things can be hidden in there and they won’t test your A1c. Now there are some, none of these tests are standalone. You have to look at them together. But, for most people, A1c is a great way to look at what your average glucose looks like. In addition to that, I would say you want to get your fasting insulin, which hardly any doctors test. So you have to ask for this. Yeah, absolutely. And then the second test, which is sort of a way to backup what you see through your fasting insulin is your C-peptide (the letter “c” – peptide) because that is going to tell you how much insulin your body is producing over the day. And so your fasting insulin tells you your baseline insulin that day, but there’s some noise in there, but then when you look at also your C-peptide, you’ll get those two in conjunction. You get an idea of what your insulin is doing and those specifically (the last two I mentioned) are ones doctors generally don’t look into, but it’s super important because it can tell you years in advance of your body completely breaking down into metabolic failure what might be going on and it is a lot easier to stop the train wreck than to fix the train that is off the tracks. And, again, I’ve got Siobhan sitting on my shoulder. I didn’t even mention cholesterol numbers, so we’re going to go there now. Well we’re going to have to have a basic lipid panel I think. Yeah, yeah, absolutely. I was taking a breather! HDL, LDL and trigs have got to be (triglycerides) have got to be a basic panel that are really useful to have aren’t they? You were talking about, we were having this conversation I think when we were at Denver, you were talking about CRP as well and how useful that can be. CRP is an interesting test and I really do suggest you get a baseline on it. There are two versions. Get the one that’s called high sensitivity or hs-CRP. It stands for C-reactive protein. What does that tell you? Well, some people will say it’s a heart marker. It’s not. It can be, but what it actually is is a generalized inflammation marker, and I think any of us who pay attention in the news these days know that inflammation is a big hot topic for a very good reason. Inflammation is sort of like, it can be very useful, but it can also be a bit of a wrecking ball within your system. Now, if you need to tear down a building, you need a wrecking ball, so if you’re sick, if you have some real dysfunction, if you broke a bone, you need your inflammation to go up because you need that inflammation to do what it’s supposed to do. However, when we have rather than acute inflammation, we have chronic inflammation which is ongoing high levels of inflammation that’s causing a lot of issues and a lot of metabolic damage, interactive damage. And so getting your high sensitivity CRP as a baseline can be fabulous because when most people go Keto that inflammation goes way down due to a couple of reasons. One is the removal of inflammatory foods and then secondarily beta hydroxybutyrate which is a ketone body has in and of itself anti inflammatory properties. That’s an interesting one. I would like to get that done and again, Siobhan, she was really excited to get her CAC done (Coronary Artery Calcium) to get that score. Now that’s one of the slightly spendy tests, you’ve got to be quite geeky and have a bit of money to spare, but certainly a very useful test to get done. Right. I would say that they tend to recommend you get your CAC at a certain age within this, you know, Siobhan’s younger, she got her CAC done. There’s a bit of discussion around if it’s worthwhile below a certain age just because you need a certain amount of age to show this kind of damage. But ,in the US at least, you can get the CAC done for around $99 and if coronary issues are of concern for you, say they run in your family or you know, you just know that you have a lot of risk factors for those things, you know, it’s certainly not a bad thing to do. And the other one that can cost a fair bit of money, but it’s one that a lot of people wish they had done to start with is a DEXA scan. Absolutely. I 100% totally completely wish that everyone had a DEXA scan to start their Keto journey. What often ends up happening, so if you don’t know what a DEXA scan is, it’s essentially like an x-ray of, that’s not the technical explanation, but it gives you an image of your body and breaks down what is fat, what is muscle, what is bone? And so one, it can kind of tell you how your bones are doing – so it’s important for like osteoporosis kind of issues – but, mainly in Keto, what we like is the body fat percentage. And one of the things that I have noticed is a lot of people don’t get a DEXA scan to start with and then they get a DEXA scan like six months into Keto and then they have a nervous breakdown because they’re like, “I have lost 50 pounds and I am 50% body fat. How is that even possible and what’s happening?”. Because they didn’t realize that before they started Keto – OK, I will say no one thinks they’re over 50% body fat and that is wrong – they were like 75% body fat before they started and were in some denial. So I mean, DEXAs can be a little bit of a rude awakening, but you know, you will be so glad you have that starting point. Yes, it’s another one I would have. I would have liked to have that but you can’t go back. It can also be very helpful in figuring out your macros. Ah, yes, very true and we will go onto that in just one second. There were a couple that I would add I think especially for women, probably all women, and probably everyone to be honest, but especially if you’ve got any inkling that you might have a problem with iron deficiency is to get an iron panel because I think that affects a lot of people and where you’re at as far as iron goes and all the things that concerned with it, ferritin and how it gets transported around your system, and different percentages, all that stuff, can have a real impact actually on everything else. So sometimes these things, if you find out there’s an issue and if you target that and fix that, it’s the same with thyroid, isn’t it? It can have such a massive effect on everything else. The other thing I, and I do come from a bit of a different perspective just because my journey has been so different because it wasn’t for weight loss, but for me, one of the things that was super helpful because I have a lot or I did have a lot of food allergies or food sensitivities caused by leaky gut and there’s an enormous number of people who have leaky gut but have no idea and they’re not used to correlating their symptoms with what they ate. I found it incredibly useful to keep a list, not how much I ate because again I wasn’t doing this for weight loss, but a list of what I ate and then I was linking that up. I mean, I discovered for myself that I was allergic to eggs because I noticed that on the days I ate eggs, about two hours after I ate them, all the skin on my feet fell off, which is weird, but true. Had I not been noting that down like I ate eggs, I ate cheese, hazelnuts, I ate whatever. It’s almost impossible to keep that all in your head and make those connections about what weird symptom could be connected to what food. If you don’t keep track of that because it might be that at some point if you’re not getting the results that you think you should be on Keto, or that you think everyone else is getting, it might be that your body’s like massively inflamed because you’re actually sensitive to eggs but you keep eating them because you didn’t know it was eggs and you take eggs out and voila, everything magically gets back on track. So that’s why I mentioned it because there’s some foods that can cause a whole lot of issue with anything working right just because you have a sensitivity to them. If you don’t know that, then you’re not going to eliminate it. A lot of people find that they have a problem with dairy. If you’re not keeping track of your symptoms and what you ate the day before or the hour before or four days before, it’s very hard to notice, as Daisy said earlier, those patterns. You can’t correlate them if you don’t write them down. So I would also advocate tracking what you eat, even if you’re not doing it for weight loss, because you can see patterns between what you eat and how your body responds that could be super important in your overall health. And I think to be honest, you both know, I’m not a massive fan of tracking for myself, just mainly because I’m lazy and I can’t be bothered! However, I did at the beginning and I do whenever I think there might be a problem. So I think it’s something that I would recommend to anyone who’s starting – that they do track, at least for a given time, especially if they’re not aware of how much is in different foods. You get people who are really surprised of, “Boy, I didn’t realize how many carbs were in this food or that food!” and you make assumptions and by tracking for a while you start getting to terms with what’s in what. And, and I know Kim, you’re much more of a fan of tracking food and macros so maybe, I know those are, they’re linked, but they’re kind of two different things. Perhaps we could just talk a little bit about the importance of the two. I also want to go, just take one step back – there were a few tests I didn’t mention and so maybe what we can do is I’ll give Daisy a list and we can put them in the show notes cause that might be a little bit easier about the baseline tests. Ulta Lab has a lot of great test packages. Another direct to consumer is Direct Labs. There are additional tests, but that depends on symptoms. Okay, so in terms of tracking, I definitely am a bigger fan of tracking. Now, what I always tell people is know thyself, right? If you are someone who you say, “Kim, if you make me track, I’m not even gonna go Keto. I’m not, I’m just not going to do it!” then don’t do it. I’m not the boss of you! I just tell people what tends to work and not work. Now, if you are not tracking and you’re not seeing the results you want, then I would come back to you and say, how do you know what to change? Because you don’t have any data. If what you’re doing is working, work it, do it, keep going, go, go you! And, for some people, that works and they do awesome and they’re fine and life is fabulous. Now, if you are not experiencing the everything you ever hoped it would be about Keto, maybe you’re not losing the kind of weight you want, if weight loss is important. As Carrie mentioned, for her, gut health and mental health were crucial. And so she really pinpointed a lot of that could be tracked in terms of keeping track of ingredients she was using and or level of ketosis. And so what needle you’re trying to move will dictate what specifically you’re tracking, but the more data you have, the more ability you have to make those adjustments. Also, though I would like to say don’t drive yourself insane! There are boundaries here. Some people just love tracking everything and so you have to find your happy spot. But I certainly recommend tracking your macros. Now that is with a caveat. Macros are only so-so accurate packages are only so-so accurate. I don’t know how fat that steak was versus this steak, that cow may have been more sedentary, this cow ate more grass. And so there is just some shrug, OK, you know, kind of so-soness you have to accept. However, I will talk to people who aren’t tracking and say, you know, “How many grams of fat do you think you’re eating in a day?” And there’ll be like, “I don’t know, 60, 70?” and then we track and it’s like 240. You know, that you can definitely use to evaluate some choices you might be making because we are just (I was gonna use a bad word!) we are terrible at estimating things sometimes that we don’t actually keep track of. The other thing I wanted to reiterate (and you mentioned it just now Kim, but maybe I’m coming from a bit of a different angle) is you, do you. I think it’s, when you’re starting Keto, it’s incredibly, there’s like, the whole world is like shouting different ways to do it and it’s very easy to get sucked into, particularly on social media, looking at someone else’s results and copying their macros. Or you know, uh, well she doesn’t eat dairy, so therefore I don’t eat dairy or she eats loads of nuts and she’s losing weight, so I’m going to eat loads of nuts. You have to find what works for you. And I think it’s really important to understand that you are an individual right at the get go so that you can kind of try and stop yourself getting sucked into this comparing yourself with everybody else because everything for you will be different. I mean the general parameters are going to be the same but, within that, you’re going to find that it takes you longer to reach your goals if you’re focused on looking at someone else’s results and mimicking what they do and expecting that to work for you. And so how important are macros? Macros, macros, macros gets thrown about all over the place. Anyone’s only got to mention Keto and macros. So, you know, what are they? And do we really need them? I think yes and no. So, macros (for people that don’t know) macro is short for macronutrients and, when people use the term macros in Keto, they’re often talking about, you know, what is the layout of how much of these three macronutrients you eat. The three macronutrients are fat, protein, and carbohydrates. I do go over macros with people. I do think macros are important. However, if you think you can plug your height and your weight into some calculator online and it tells you that you should eat 19 grams of carbohydrates, 72 grams of protein and 137 grams of fat, or you’re going to fail! It can’t know that! Your experience matters. But macros are often a good place to start, but I would rather people have a slightly more nuanced understanding of macros. What are they for? So protein is a building block. We eat protein to rebuild our bodies. They get torn down on a daily basis. We need to rebuild them. It’s useful for building. It is a structural element. It is not primarily an energy source, not primarily, notice I use the word primarily, that is not its primary job. Carbohydrates and fat are primarily energy sources, but on a ketogenic diet we’re limiting carbohydrates so then fat becomes our energy source. Therefore, how much carbs, protein and fat we’re eating is very dependent upon our body’s energy needs. And so I would say: one, macros are very important, two, not in the way most people use them, three, you have to actually understand what is happening in your body to properly know how to calculate your macros. So they’re useful in a place to start. I think so so many of these things is you, you need a place to start, you have to start somewhere and you have to start with something and you have to start with some kind of guideline of how much of each of those macronutrients to eat but, like you say, there are so many nuances involved but you gotta start somewhere. Absolutely. Macros are a starting place. Experience is what tells you how to tweak from there. It’s also good to know at this point that you decide are your macros when you start, is going to change because, as you heal and as you lose weight (if that’s one of your goals), your requirements (what your body needs) is going to change. So what you start out with is not written in blood. You will have to reevaluate that every, I don’t know, three months, six months or if you plateau, if you stop getting the results, if things stop changing, then you will need to change your macros to match the new you. And so you’ll have to go through that process repeatedly as you go along. But I think it’s good to know that now because I think a lot of people think, okay, this is what I’m going to eat forever and in, in my experience, looking at the thousands of people that I’ve interacted with, that’s just not true. You actually, you will progress and your macros will change and your needs will change as you go along on your Keto journey. And the types of foods you eat will change, though I think the way that you start is not necessarily the way you continue. Maybe you start Keto very dairy heavy and that’s totally working for you and you’re doing awesome and things are going great, and then at some point something has shifted and suddenly it seems like your body doesn’t like dairy anymore and you have to respond to that. I think one of the tough things that people don’t always love about Keto when some people love it, there’s like two camps, there’s always you know, two camps, but there are the people who are like, “Just tell me what to do and I’ll do it and I want success and I don’t want to think about it.” And then there’s the other group which is like, “Life is an experiment and I’m always tinkering.” I would say the first group will probably struggle with much more frustration than the second because Keto is an adventure. It is always interesting and it is not one size fits all so, if you’re looking for somebody else to tell you what your body will do based on the information they’re giving you, they’re guessing. Now they may have a very educated guess. I do a lot of guessing. But then you do checking, guessing and checking. And if you’re not doing the checking part you might be very sad. And I think from the most basic point of view, whether you’re really into tracking or not, the one macro that everyone needs to focus on is carbohydrates and simply limiting them below a certain level. That’s another question. Well there are two things because you see macros expressed as percentages, which I don’t think works very well, I think it’s better to look at grams. So you hear that magic number of keeping below 20 grams of carbs per day. And again, that that is different for everybody but that’s a kind of a general rule that’s going to work for everyone isn’t it? But the other thing that gets asked a lot, and I know you get this question a lot is net carbs or total carbs, which should I be going for? I am firmly in team total! I’m firmly on team total for some reasons. One of which is actually something you just mentioned, right? Which is some of us have a higher carb tolerance and some of us have a lower carb tolerance, but we tend to recommend, and I tend to recommend, the lowest common denominator, right? Which is 20 works for almost everybody, so let’s go with 20 right? In terms of if you just need a number for grams of carbs and you’re not going to test what specifically is your range for where you stay in Ketosis? Some people can get away with more carbs and, just as an analogy, some people can get away with net carbs. But I don’t go by, I don’t suggest what some people can get away with. Like I don’t suggest not wearing your seatbelt because you may not get in a car accident. I suggest doing the thing that I find most effective for most people and that is counting total. There are a couple of reasons. One, it’s less complicated. Two, some people are affected by fiber, depending on the type of fiber. And the other thing is that food manufacturers are getting very, very sneaky. I also have tolerance. If you say, “You know what, when I eat a lot of vegetables, my ketones are great and I don’t have any issues, so I’m going to count net carbs on leafy green veggies” and I’m like, “If that works for you, great.” But I certainly would not suggest net carbs on any package products with a lot of fiber because there are metabolically active fibers that they pretend aren’t. Yes, exactly. People can get freaked out and I think that is often with a packaged goods isn’t it? They’re like, “What? Someone recommended this and it’s millions of total carbs.” And it’s because it’s got the sugar alcohols and everything in it. That’s another thing that’s interesting that is a debate that goes on and I certainly know that I’ve changed my opinion on it as I go and that’s how many of the Keto treats types of foods and the carb substitute types of foods to include in what you’re doing. And, as I say, I do think it changes as you go on. When I started Keto I wanted to play around with all those kinds of recipes and make the perfect Keto bread and cookies and all the things and that can be really good to see you through that hump. I’ve come to the place now where I hardly eat those kind of things because I find that they tend to bring out cravings and things for those types of foods and I tend to overeat and so on. But have you got a go-to or is it completely flexible about whether to go there with those kinds of foods when you start? I think this is so, so personality based. It really is knowing yourself, you know, people will talk about – apparently I’m very binary! – there are two groups. There are the people that will say don’t feed the beast, right? If you feed the cravings, they’ll just follow you around. Like don’t, don’t treat him like a stray dog. And then there are other people that say, “You know, when I have the Keto brownie, I don’t eat a regular brownie. That is a win for me and I’m going to call that a win and be good with that.” I think it depends and people tend to know. Like last year at Christmas time I was like no more sweets for awhile. Like I was just done with them and I, you know, I had a month of just kind of meat and a little bit of veg and that was great and then you know, at some point in the future, I might say, “You know, I’m kind of feel like making some Keto something or other” and I’ll do it. My list of products that I will buy that are Keto treats is exceedingly short because, if it has ingredients that require I have some type of a lab in my house to make, I don’t want to eat them from the lab, from the, you know, the purchased product either. And I’m not trying to like say like science is bad. I’m not, I’m not saying that, I’m just saying I know how certain foods work and if I don’t understand what the food is because it’s been changed so much biochemically, I can’t trust it anymore. Good point. What about you Carrie? You’re into all things to do with cooking. What’s your view on this for somebody who’s starting? Plus they do taste like complete crap as well! They do. And because I’m less focused on weight loss and I know how to keep myself in my brain happy range, I will try or I’ll have a bite of all of them. And I can tell you that 95% of packaged products don’t even get on the bottom rung of the scale of tasty in my little world. So I would always suggest, for different reasons to Kim, but I would always suggest that learning how to cook some things, simple things, and using real whole foods is always going to be a million times better than any packaged products you can buy. There’s a few exceptions to that rule, but honestly, if you look at the recipes that Kim and I create, it doesn’t take you to have a degree in the culinary arts. It does not take a ton of time. It does not take a lot of fancy equipment or expertise. We’re really focused on helping you become brilliant in the kitchen in a way that you probably never thought possible, but in very simply and easily and quickly, being able to create delicious Keto meals that are better than anything you’ve been eating for your life so far and are light years better than any packaged product you can buy? Yes, I must admit what I’ve found with, and I’ve got to sample a few more of these products, the ones that are the nicest are the ones that are quite close to home cooked foods. It’s the ones that have quite a short shelf life and they are basically home-baked Keto foods that might have a bit of preservative or some kind of thing in there to extend their shelf life a bit, but they’re basically pretty much what you could do at home and they’re the nicest ones that I found. I think whey is a problem in my experience a lot of people find whey products very difficult to lose weight on. And a lot, I would say the majority of products out there that are kind of like a baked thing or a bar or something that’s cooked, they’re going to have whey in there. So I won’t even look at products that have whey in them. Yes, I feel that it’s a bit problematic. I know you do too as well, don’t you Kim? Yeah, I mean I think there is a time and a place potentially for use of things like whey protein isolate in terms of are you a bodybuilder person who’s looking for a specific type of an effect? Biochemically and what it, but I don’t use it as a filler ingredient in baked goods. It’s a targeted type of isolated protein that you may or may not think is useful within a certain context. But I see a lot of people using it as a, you know like a “free flour” in a baked good because, “well it doesn’t have any carbs!” But it does have other effects and I just simply find from experience people don’t do as well when they include it for the most part. Now the poison is sometimes in the dose, right? Like I once saw a creamer that had what was probably an infinitesimal amount of it. That would be different say than you know, making a whey protein shake. So you know, I also want people to use common sense. But most of these packaged products: one, they don’t taste good, two, they aren’t great for you, three, I think there’s just some sort of like mental pathway that they awaken about junk food eating. It’s just bad layered on, not good, layered on sort of meh. I don’t think that’s a good layer cake. There are recipes you can make that are super easy and there are a few products that are tasty in my opinion and not so bad. So stick to that short list and or cook a little bit is probably the better way to go about things. However, when you’re starting out, if grabbing one of these products is what’s going to keep you going, do that! Because we would rather you stay on of much of you on the Keto train as you can when you’re starting out than completely go and buy a box of Little Debbies and chow down on those. Absolutely. I think a very important thing that we have stolen from the 12 step community is “Progress, not Perfection”. I think if you’re like, if I’m not perfect, screw it all. I’m having the Little Debbies. You might want to just reevaluate your mindset and make the best choices you can today and you can make better choices tomorrow. But if you’re caught out, if you’re in a situation where you didn’t plan well or the day went sideways and you find yourself out and you have a Quest bar in your bag, eat the Quest bar rather than drive through McDonald’s and get a Big Mac and fries is all I’m saying. Exactly. There are always those choices in the moment to make aren’t there? And I think what we’re talking about underlying this, and it’s an important thing to deal with are cravings. Cravings you’re getting for those old, carby foods, that’s when you’ve been doing it for a while, but it might just be those carby foods that you gave up yesterday. Well it looks like we’re going to have way too much information for just one show, so we’re going to break it here and come back with part two next week.